By Sia in Internet. March 16, 2017 . Not too long ago, we talked about Hangouts Meet, the company’s attempt to turn Hangouts into an enterprise-focused service. Apparently, Meet is just half of the new Hangouts experience as Google has announced a sister service called Hangouts Chat. Where "Meet" focuses on teleconferencing space, "Chat" focuses more on the team communication space like Slack, Microsoft Teams, Workplace by Facebook and other similar services. Described by Google as an "intelligent communication app", Chat will come with dedicated, virtual rooms that will allow teams to discuss about their ongoing project. This feature will be familiar to those who are used to "Slack". On top of virtual rooms, Google will also be introducing threaded conversations into Hangouts Chat. This feature allows users to monitor their conversations easily without needing to sift through the entire chatroom. While all of these features seem par for the course, the feature that sets Chat apart from other services of its kind is the inclusion of a bot called "@meet". 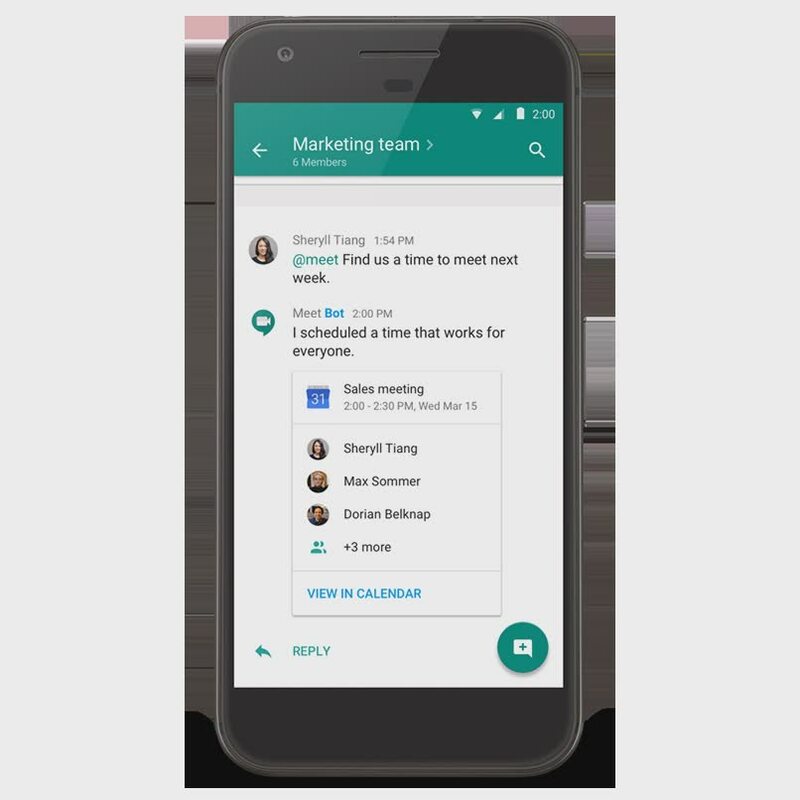 Built on top of the Hangouts platform, @meet is capable of leveraging natural language processing and machine learning in order to do certain tasks such as scheduling meetings for the team. Finally, as Hangouts Chat is integrated with G Suite, you’ll be able to share content from Google Drive and Google Docs with ease. On top of that, Google will also be teaming up with companies to build third-party services into Chat via Google App Script. Some of the companies that will be involved in this particular venture includes Asana, Box, Prosperworks and Zendesk. Hangouts Chat will be available on the web, as well as on iOS and Android platforms. No release date has been announced for this feature just yet, but the app is now available for use as part of the G Suite Early Adopter Program.